Chinese smartphone manufacturer Xiaomi will celebrate its eighth anniversary this year. The company will commemorate the occasion by launching a special smartphone with heavy-duty specifications just like Apple did with the iPhone X last year. The Xiaomi Mi8 is a relatively new device on the rumor mill, especially when compared against the Mi7. Originally, it was expected that we’ll get only the Mi7 this year but as Xiaomi’s latest teasers illustrate, the Mi8 is a done deal. On that note, we’ve got more details for the device today. Take a look below to find out more. A lot of sources speculate that Xiaomi will introduce two big-ticket features simultaneously on the eighth-anniversary Xiaomi Mi8. However, before we get into the details, it’s relevant to take a look at the past. Before May, the majority of sources expected that Xiaomi will launch only on iteration of its Min lineup, namely the Xiaomi Mi7. Then, leaks for a second Min device started to surface alongside claims that Xiaomi will mark its eighth anniversary this year and launch the Xiaomi Mi8. This device will feature both virtual. fingerprint and 3D facial recognition. While at first, this sounded a bit too much, talk of under/on display fingerprint sensing fell in line neatly with some firmware investigations which had revealed a Mi device with an unconventional fingerprint reader. Speaking of unconventionality, HTC launched the U12+ the day before with a translucent back. 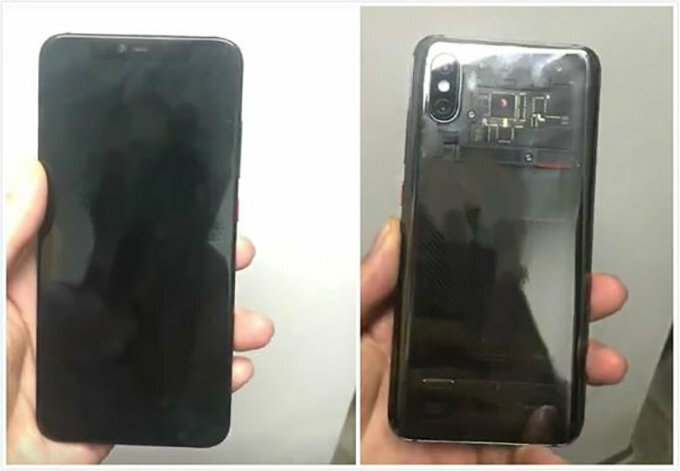 Now, we’ve got a fresh video which allegedly displays the Xiaomi Mi8 with a similar feature. In addition, the Mi8 as you can see above also houses a display notch that’s a bit wider than one found on current Androids. Does this entail 3D facial recognition for the Xiaomi Mi8? Maybe, but don’t take it as a given for the moment. We still believe that it’s highly unlikely for Xiaomi to work out the complexities behind the feature. 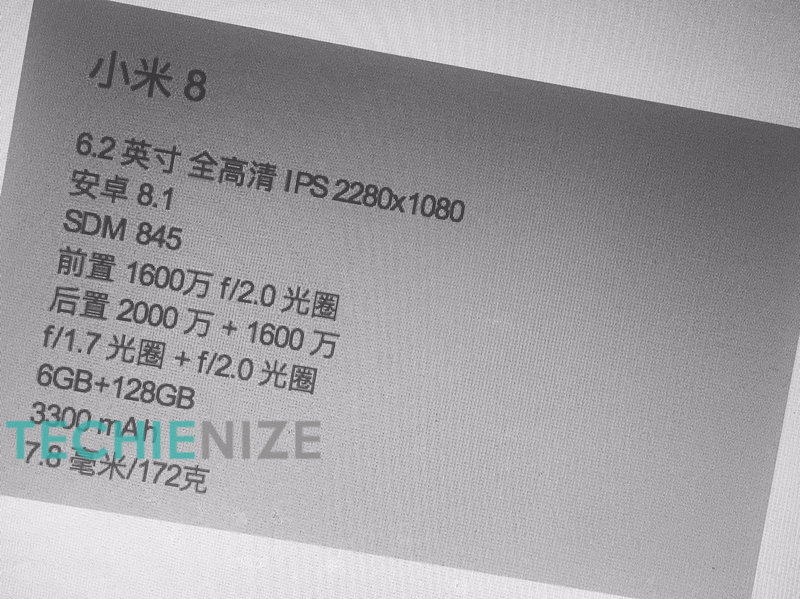 In that vein, we’ve got another leak today that purportedly displays some key specifications for the Xiaomi Mi8. The image above is from a little-known tech publication and we’re not sure of what to make of it. Given the of its source, we’d advise you to take this information with a grain of salt. That being said, this information claims that the Xiaomi Mi8 will feature a 6.2″ display with a 2280x1080p resolution. The device will feature a dual camera setup with 16MP+20MP resolution. At the front, the Xiaomi Mi8 will sport a 16MP camera sensor. The device will run on Android 8.1 out of the box and carry a 3300mAh battery back. You can also take a look at its rear camera aperture widths in the image above. As we head towards the Mi8 launch, set to take place on the 31st, the big question on our minds is: Will Xiaomi launch 3D facial recognition with the device? Maybe, but don’t expect it to be a feature that is on par with Apple’s True Depth setup. Thoughts? Let us know what you think in the comments section below and stay tuned. We’ll keep you updated on the latest.